I kind of think this post by Runner Unleashed works as a pretty good PSA. Plus, people have been asking me how I run in such “high” temps and high humidity (other than that, compared to south Florida, these temps are fine, baby!) and I think much of being able to handle the temps is due to being properly hydrated. I drink at least three liters of straight water during times like this, and take in enough other fluids besides. I am proud to know the light yellow color very well (ha ha, sorry for TMI). Also, something I learned last year was that dew-point is a good indicator of how difficult the run will be, more than the heat-index. This chart was put together and depicted in the Running Times. Enjoy reading! I’m going for a run. Now that we are right smack in full on Summer weather, running can be difficult. The hot weather makes it a little tougher on the body, mind, and training. So what happens when you run, you sweat. What happens when you run during the hot days? You sweat so much you feel like you went swimming! 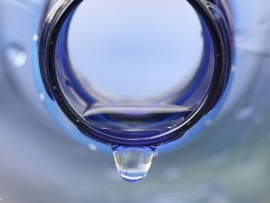 Well, its time to talk about hydration and its benefits. Being hydrated is VITAL to your performance and overall health. Dehydration is where your body lacks the amount of fluids, mainly water, to function properly. Our body is made of more than 60% water, so when we sweat, breathe, and use the bathroom, we are using up that fluid percentage. So if we are constantly using our reserves, we can become dehydrated. Two days to recover, two days to savour- HaSpa Marathoner! I suppose I could have seen it coming, but yesterday would not have been any better even if I had been better prepared for it. Who put me on the second floor of my building?! As to be expected after 26.2 miles (or the scarily higher-number 42.196), my quads were not happy with me. I was happy with them, though, and what they had accomplished for me. For one thing, I’m glad they took the beating without letting it out on my knees or knee ligaments. Still, climbing stairs (worse, going down them) was no fun lately. Actually, it was bad enough to put me in a bad mood until dinner time, where I was finally home and allowed to rest again. That’s saying a lot, since I’m a generally happy person. But since that’s the worst of it, I will say I’m grateful with how things turned out. Basically, I had a good run. No, actually, I can say I had the best run of my life thus far. It was especially great to have people to meet before the race, take care of business with (pun intended, though not literally with) and wish one another luck. 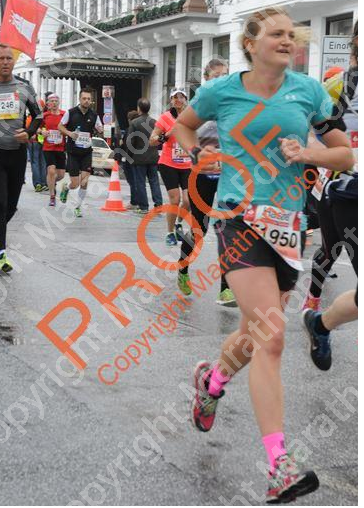 This was the first marathon where I actually feel like I raced it. It’s a tough distance to run and I think that the first time, I only ran to run.The second time, I ran to race, but ended up not fueling properly and not being well enough prepared. This time (three times a charm! ), I fueled hella well, but maybe could have been more prepared. However, the point is, I knew I could have raced smarter, and that, I think, is the truth to the beginning of a beautiful life aspiration that I can carry with me from here on out. Here’s a picture of me at 16K. Of course it has proof running across it. Does anyone want to buy it for me for 39 Euro? Just kidding. I think I’ll wait for another race. At least, I figured out that what they (people like Sabrina Mockenhaupt, the German favorite at this marathon) mean by saying “the race begins at mile 20 (or kilometer 30). I had two plans for this race. One was in regard to fueling, and the other in regard to running. Both aspects needed separate, but equal attention. For running, I took the advice to not start off too fast very well… perhaps too well, as that is probably what set me back the few minutes it would have taken me to run a 3:47 (my less-reach-goal than 3:45). I walked across the starting line (not that I had much of a choice with the mass of people around me) and settled into a comfortable 9 mpm pace. No weaving or skipping across people’s trajectories for me. I just wanted to take it easy, soak in the sprinkling of rain and people’s cheers at the starting line, and appreciate the fact that the race was indeed underway. My first 5K split was 27:56. I had an almost even split for the 10K, coming in at 55:51. This was slower than I had anticipated, but I wasn’t worried about falling too far off track yet. I just wanted to take it easy, make sure all systems were in check. I had slight tightness on the back of my knees and my right hamstring, but it wasn’t a dangerous kind. I also had to go pee since before we had even gotten started, but I told myself I could handle it. I would only stop to go number 2, if I had to. Turns out, I was able to finish the race without stopping. Success! So there I was, trotting along at a reasonable pace, feeling alright about things, couldn’t stop smiling about the cheers, running through the streets like a rebel, running, hearing the conversations around me, and feeling life in color. I had a few people from my dorm I was expecting to see on the course, but I think I must have missed them, and they me. But looking for them through the faces of the spectators, while exhausting in its own way, took my mind off running. Part of my plan was to keep steady until the half-marathon point, and then pick it up for a negative split. I split my sections into 3 miles, which coincided with the 5K splits the race course was divided into, and just stayed positive. After nine miles, I thought to myself “already 1/3 through!” I had a similar sort of feeling after 18 miles… the race was almost going by too quickly to be true! I will say that things got harder after 22 miles. At mile 20, I told myself “10K left to go!” and thought of how simple that distance usually is for me. But after 20 miles, 10K is a lot and it became harder to keep up the pace. Even though I was still keeping a pretty steady 8:45 pace that I had started around mile 14, consistently passing people (always making sure to pass on an encouraging word or sentence- and passing people is psychologically very motivating for a competitive person like myself) things (my quads specifically) were starting to hurt. Also, anytime I slowed down to get water, a banana or a gel, I could feel the lactic acid starting to build up. It took forever to get to mile 23, where I could tell myself “only 5k left!” Mile 24 was a blur, and I hit tunnel vision around then as well. Mile 25 was only a “one mile left, one mile left” mantra, and at the 42K mark, I could see the finish line. I hit full-speed (as much as I had) and went soaring in… into the wrong entrance. There was a relay race done for this marathon as well (6,000 runners doing the relay! ), and I ended up in the lane where they ran in together to finish. I saw this just in time to turn around before hitting the finish line, but it cost me at least 25 meters. I must have looked like a dork, though I was too high off running to care, but I did have huge thumbs up to show! I’m proud of my ability to stay strong through the finish. This is the first marathon where I did not walk. I am also very pleased with my negative split. The only thing I regret, is that I realized with my spurt at the end (I passed at least 20 people in the last 200 yards) that I could have run a faster race. Oh well, that’s what next time is for. For now, I have a 7+ minute PR and an idea of how these races are run. Here’s a picture of me at 38K. I wasn’t just saying it when I wrote that I couldn’t stop smiling. I didn’t even know this picture was being taken. The way I ran, of course, would not have been possible if I had not fueled properly. The other plan I had in regard to nutrition was something I developed during my long training runs. I used to be (and still am, for the most part) someone who will run 13 miles without bringing fuel or water if I can find fountains along the route. This can get tricky in Florida, but in northern Germany during the winter and early spring, dehydration was not really an issue. If I ate a sturdy breakfast and had a decent amount of simple carbs the night before, I could head out and feel strong for 13 miles no problem. However, at some point during my last marathon training cycle (which ended with injury), I figured out that I can run better after 15 miles if I’ve eaten something during it. This marathon training cycle, I discovered that eating something as early as 6 miles in would ensure I had the strength to pick it up and stay strong through the end of my run. If I ate again at 13 miles, I had enough to get through 18 strong, and if I ate at 18, 20 was a breeze. Basically, even though I’ve read the advice for years, I never actually practiced mid-run fueling properly. Now I have, though I find that refueling every 6 miles works best for me. The best part about this marathon for me was that they provided bananas, electrolyte drinks, water, and the energy gels (albeit gels only after 22K). As someone who has decided to go sugar-free, bananas on the route were amazingly thoughtful. The food aid stations came every 5-8K (perfect for me to take something every other time ) and the water was every 5K. I felt weak between miles 10 and 13 (because I hadn’t taken solid fuel yet, my mistake), but got a high around mile 13 and picked it up after each refueling on the route. That could account for some of my smiling on the route. While the fueling during the run was almost perfect, I still need to work on pre-race fueling. I took the advice that carb-loading should start 72 hours before the race, and had a good balance of complex and simple carbs during the Wednesday-Saturday of the race. I was actually feeling good-energy was high and I felt confident. But then I overdid it at the pasta-dinner a fellow soccer player and runner hosted, and ended up with a little too much in my system. I didn’t feel stuffed or bloated, but I knew I had too much, on top of what I had already consumed, leading up to this race. Thus, on race morning, because I knew something had to leave, I resorted to a very risky measure. I took a laxative early before the race… it worked within 15 minutes and all was well (sorry if this is all TMI), but I don’t ever want to have to risk it not working in time again, or working for too long. I will be more careful about what I eat the night before the race next time. I’m thinking that the last full meal should be at lunchtime, and then a lighter supper fare is more reasonable for the evening. I still stand by my yogurt, fruit, and coffee on race morning though. All in all, this was a great race. As some closing notes, I’ll say that the German racing system is kind of neat. 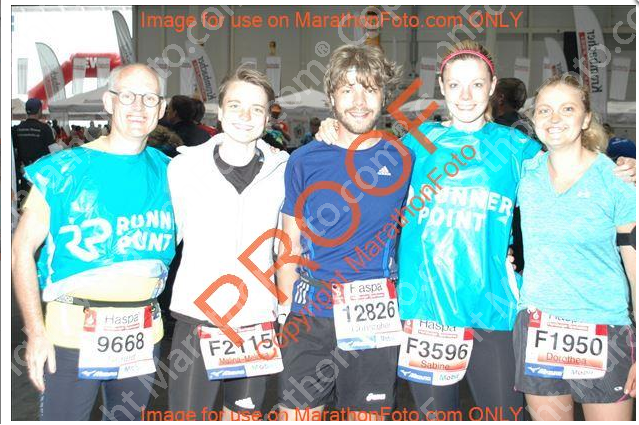 They also took a picture of me at the finish line, but mine is not updated yet. They’re still sorting through multiples of 21000 to get everyone their links. I also got to know the city of Hamburg is a splendid new way. We ran by some of Hamburg’s best sites and I saw the Stadtpark, an area I had never previously seen before. It was beautiful. The people of Hamburg also put on a great supportive face, coming out despite the poor weather. 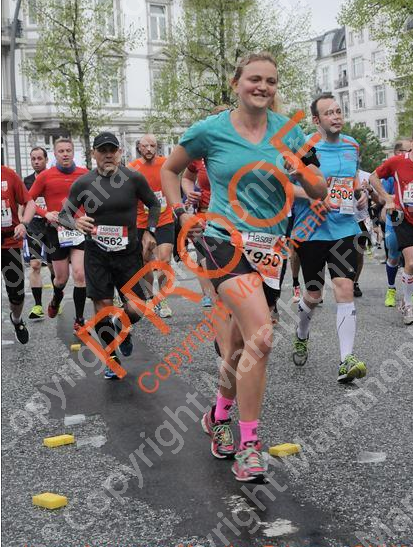 I had a lot of random people yell “go Dorothea!” or “Lauf, Doro!” (Doro being the German nickname for Dorothea). It was really encouraging and the race was so much fun. I can only say again and again how happily I would do it again… though give my quads a chance to recover first.